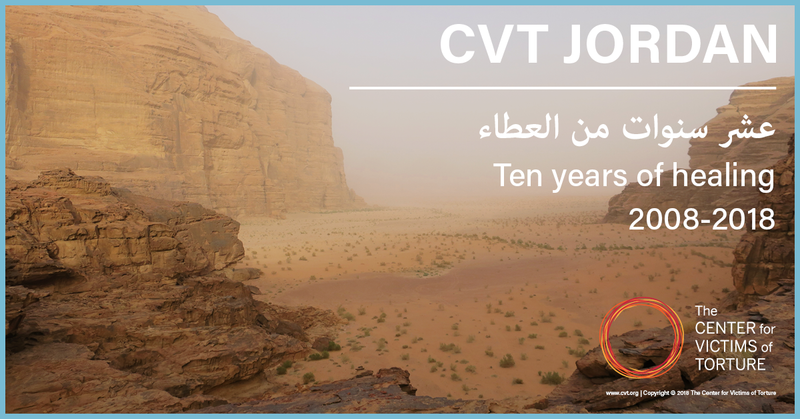 We're proud to mark the 10th anniversary of CVT Jordan, which was established in Amman in 2008. Since then, CVT Jordan's work has expanded and evolved to meet the changing and growing needs of survivors of torture in the region. CVT Jordan's 10th anniversary is big news! Read our release here. CVT Jordan achieved several firsts for the organization; for instance, it was CVT's first international direct sevices program outside of Africa. Read about this, and other firsts, in our CVT Jordan 10th anniversary blog post. Read a statement from Richard A. Albright, deputy assistant secretary of the U.S. Department of State, Bureau of Population, Refugees and Migration, commending the work of CVT Jordan! Watch this video of highlights from CVT Jordan's 10-year span. Check out this CVT Jordan: Then & Now infographic. See who we serve at CVT Jordan. Learn more about the logistics of CVT Jordan's work in the Middle East.